First up, a session on science research in the Islamic world. This was interesting; It was presented by a couple of journalists, one of whom went to Indonesia and the other to Egypt to learn what they could about the life of scientists there, of science funding, of science careers and education. Clearly, the amount of R&D funding in many of the countries is low by European standards, but one fact seemed quite amazing: The entire output of scientific papers from the OIC countries is about the same as one Ivy League University. The reasons are manifold and understandable. The speakers had some suggestions as to how it might change, and some grounds (e.g. democratic revolutions, though the one in Egypt has not had much effect on science yet) to expect that it might. If it does, it will hopefully improve quality of life in those countries and enrich the world’s intellectual and cultural community. Next, a keynote address by Máire Geoghegan-Quinn, European Commissioner for Research, Innovation and Science. She spoke extremely well, as you might expect from a European Commissioner. She thinks much more like a scientist than politicians often do, and she led a discussion on how to create an environment in which science really works well for society in a very holistic way, with room for “curiosity-driven” and “challenge-driven” research and a balance between competition to drive innovation and collaboration to get a sensible use of scientific cooperation. All very sensible stuff. She also talked about future EU funding of science, and the upcoming Horizon2020 funding round in which more funding would be available for research via the EU than ever before. One of the speakers on her panel, Subra Suresh, Director of the US National Science Foundation, recounted the anecdote in which Gladstone asked Faraday why the exchequer should finance his studies into electricity, with Faraday responding "One day sir, you may tax it" – always a good story to tell when politicians ask why they should fund science. Next up I decided to go to a session on the future of the arctic region in a time of global warming. There were two geophysical talks, and two sociopolitical. The geophysicists were clear that global warming effects would be particularly accentuated at the poles, as indeed they already are. Partly this is because as the ice and snow melts, the less-reflective surface of the earth at the poles absorbs more sunlight than it used to. It now seems inevitable that the arctic ocean will be ice free in summer by 2050, and there’s not much that can now be done about it. 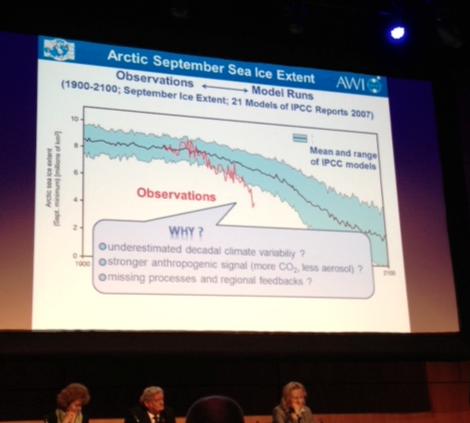 The picture above shows a photo of a slide in which the ice coverage of the ocean can be seen to decrease even more quickly than the most pessimistic predictions. Next was a packed crowd for Brian Greene, physicist, author, broadcaster, and housewives’ favourite (sorry Jim, I mean second favourite). He was giving a kind of state of string theory talk, though given the general audience, it was really a general overview, with as up-to-date a flavour as he could give it. He was engaging and witty, though I thought the casual inclusion of complicated equations and long words a bit show-offy. On the other hand, he was not trying to sell string theory too much, and motivated it as a purely mathematical attempt to find a theory that would reconcile gravity and quantum mechanics. In the end, with the talk about multiple universes, and some catchy graphics, my mind was quite blown, and I was reminded of the reasons why I always wanted to be a physicist. Now I’m sitting in a much more prosaic talk about the worth of global university rankings. I have one more event this evening on Open Access journal publication. Well, unless I get a late invite to the media party at the Guinness distillery. I haven’t yet (hint hint), but like the Murphy’s, I’m not bitter. I should also say on this post, and the previous two, please do comment if you feel at all inclined to. It’s part of what blogs are about, after all.